Chris and I talked through day by day on our plane ride back (we are home now). I'll write some final thoughts in a final post. I will also upload more photos from a faster computer. rainy & gray. Crash bent Chris's front wheel 5 miles in to ride. Skymonish is a federal super fund site so the whole town is getting dug up to clean the soil. Camped at a very old school. Long climb over Stevens Pass. Rainy on the east side, clear on the west. Snow on top of the pass. Cold, wet 11 mile descent. First glimpse of the Cascades at the bottom. Great riding along a river in the afternoon. Bought a new wheel in Wenatchee. Long, hot day at 103 miles. Nice riding with some of the staff (Megan, Eve, Chris). Great view of dam at end. Beautiful views of lake, saw 3 moose, 40 mile bike path with a tail wind. Camped at a school near a ski resort. Climbed Thompson Pass – Long winding road to a lunch stop at the top. Great downhill. Bought milk shakes at shop in town. Great meal from the Elks. Bear was sighted near school in the evening. Showers at local swimming pool. Started out in a beautiful valley. Then long hot day on a busy, fast noisy road with a rough service. Mentally challenging. Ate Thai food at night, enjoyed walking through town. Same busy road – route 2. Nice espresso bar at end. Student at school said best thing to do in town was try local beef jerky. Beautiful sunrise with rainbow. Hard wind at end of day – 20 mph head winds. Celebrated with cheers when we hit town sign, we were so glad to get out of wind. Storm at night. Thunderstorm in morning. Just missed lightening bolt by a few hundred feet (heard air sizzle/pop). Chris got sick and took sag wagon. Met Anne at lunch. Chris was sleeping on school bench when I arrived. Got ice cream in Ennis, then got him chicken soup. Chris rode sag wagon and enjoyed stories from Grant (staff). Saw earthquake lake. Lunch was up a steep hill. I felt sick all afternoon – maybe due to altitude (5000 feet). Tough head wind last ten miles. Took it easy so Chris could recover. Small town at end – nice coffee/wine bar. Middle school kids cooked dinner & breakfast – very slow. Road a scenic highway, saw Tetons first time, beautiful stop at Mesa Falls. Rode through scenic potato fields. Great tailwind at start. Then incredible climb over Teton Pass – long tough struggle. First time I ever felt the need to stop on a hill climb – but didn't. Really out of breath. Fun but winding downhill (tight turns) into Jackson. Anne, Nancy & Bonnie (Peace Corps friend from Montana) with us. Ate bagels at camp style. Drove through Tetons to Jenny lake. Boat across lake, then hike to falls was scenic. Slow service at pizza place at night. Slept at hotel in Jackson. 17 mile uphill. Several cyclists in Dubois as it is on Trans America Bike route. Anne saw us several times along route. Bad coffee at breakfast – got espresso at local shop where the trans-america cyclists were stopping as well. Went out at night for nachos as dinner was so sparse. Easy day. Beautiful Wind River canyon ride at start – scenic rocks, cliffs, tunnels. Stopped at the Thermpolis hot springs after lunch. Chris rode with Scott at average of 20 mph for 100 miles. Up over last set of hills – the Big Horn mountains. Rolling hills at start. 25 miles of uphill. Six miles of tar & chip sealant. Rocks got in derailleurs of two bikes and destroyed them. Lunch part way up to pass – then 5 more miles. Highest point on tour at 9666 feet. Next thirty miles had lots of rollers and was very hard – hills never stopped until final downhill last 5 miles. Rode interstate 90 fifty miles. Seemed strange to do that, but it was also safer with wide shoulders. Before lunch was great with wind,cool weather. Then it got hot and got tired of road. Chris and I rode hard (22 mph) before lunch. Then he took off afterward and was first to camp. Went to coffee shop in Gillette for afternoon. easy, pleasant day. Parade at picnic. Nice ride with Nathan. Devils Tower at end – strange formation. Great downhill into Devils Tower. Showered and got ride to Rapid City. The last day was very pleasant. We rode with Nathan (20 yr old from CA) and his mom most of the day. It was a short day at 68 miles with clear weather. Chris amazed me n some early climbs – they were short (¼ mile) and he went up no handed. Pretty good leg strength. Lunch was in a small town park. They were having their Jubilee celebration so we saw the parade of horses, firetrucks, and political candidates. It was a very jovial atmosphere. Towards the end of the day, we stopped at a combination steak & coffee shop (Phu-Phu coffee) for a final treat. We had a good discussion with the owner on different ways to make espresso. Then we started the final down hill into Devils Tower. One car came close to us – for the most part we felt pretty safe with cars on the rad. Two close calls were with mini-vans (side mirror less than a foot from our shoulder). Unfortunately they probably had kids in them and the next generation of drivers was getting trained to drive poorly around cyclists. We got to Devils Tower – very imposing. We showered and waited for a van ride to Rapid City. We had some nice good byes with people. At the Hampton Inn where we stayed before getting to the airport, USA Today talked about a new program called “Let's Move Outside!” Chris and I laughed – we did that pretty well the last three weeks. Fri July 9 - the interstate! Today was strange - we rode Interstate 90 for 50 miles. Bikes are allowed on it out here. It is weird to think that is the same highway that goes through Chicago. Most exits are dirt roads, so that tells you how rural it is here. Mini valleys along the route - historical markers said Wooly Mammoths were trapped in the valleys and speared. Worland to Buffalo, WY - 92 miles. This was our longest day of riding - almost 7 hours of ride time. It started easy with 25-30 miles of simple rollers. Some were pretty tough, but not too steep. We had espresso at a town called "Ten Sleep" (called that because in previous times it took ten sleeps to travel between towns). It was fun because there were so many cyclists doing the same. Then the climb started a few miles later. In the end we had a 25 mile climb where we gained about 5000 feet. It was not too steep - just never ending. The worst was there was fresh chip and seal (stones and tar) for six miles. At one point Chris and I were just a few hundred feet ahead of a tar truck. We pushed hard to not get stuck in the mess. Lunch was 20 miles into the climb. That was hard as we had good cream of potato soup and chicken curry for sandwiches. However, we had a ways to go. We got to the summit of the Big Horn pass at 9,666 feet. Both of us felt good and were ready to keep going. Actually, each of us had leg massages by the trip masseuse last night - that helped a lot in preventing leg pain today. The descent was "varied." We went down and up for 10-15 miles. On other passes it has been downhill after the summit. Here we had rollers where we descended a quarter mile, then ascended. They were exhausting. Finally at the 80 mile point we got a sweet five mile downhill. We stopped at a few points for good mountain photos - including flowers and lakes. Tonight we are enjoying pizza at a restuarant in Buffalo. I am sure we will sleepwell tonight. A great day! Yesterday I was exhausted, today I feel better. We started out a bit late, the school was slow in serving. The scenery was incredible. We biked through a canyon the first 45 miles. I have never been in a place like that. We had good wind, beautiful scenery and a generally nice road ( a bit heavy with traffic). I don't know our pictures do it justice. I looked for mountain goats, but never saw any. Lunch was along the river - beautiful again. Chris took off after lunch so I rode alone. 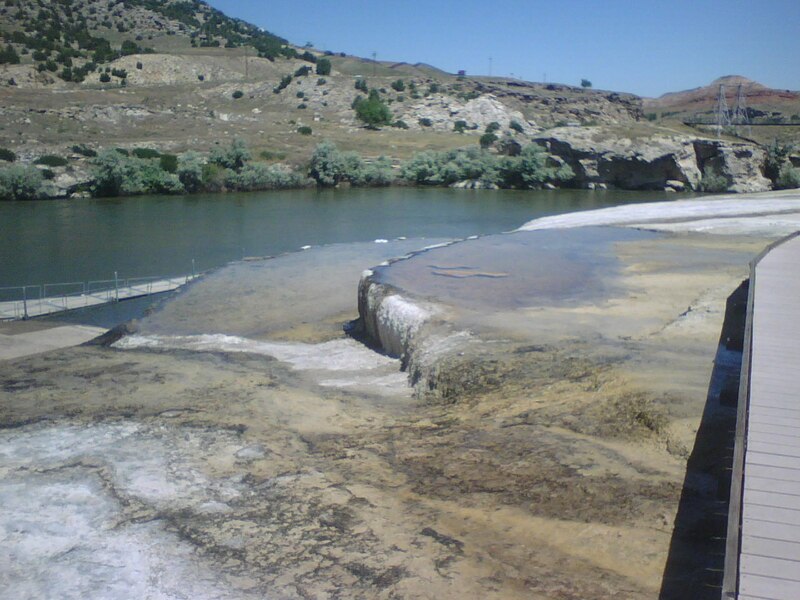 I stopped at the Thermopolis Hot Springs state park and looked at the hot springs. 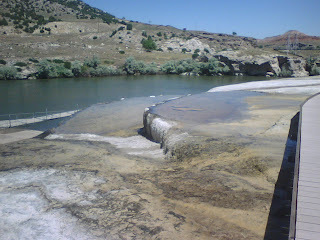 I did not swim as I still had a long ride, but it was amazing to see the rocks and pools of warm water. Chris again set up the tent then we went for iced mochas. The coffee lady was excited to hear of our journey - a bit in awe. She gave us a bag of espresso beans to enjoy. We will need them Thursday. It will be our last big climb. We go 30 miles flat, 30 miles of climbing to about 10,000 feet (5,000 foot gain in that 30 miles) and 30 miles descent. Today we came over the top of a hill and the wall of mountains was in the distance - very imposing!